Turmeric is the common name for a herbaceous perennial plant, Curcuma longa, of the ginger family Zingiberaceae, characterized by a tuberous rhizome that is short, thick, tapered, and somewhat fleshy; lance-like, elongated leaves on erect, thick stems that extend upward directly from the rhizome; and pale yellow flowers appearing in a cylindrical cone that also arises from the rhizome, with the flowers partially protected by leaf sheaths (bracteoles). The name turmeric also is used for the dried, powdered rhizome that is popular as a spice and food color, as well as used medicinally. Turmeric, which often is misspelled (or pronounced) as "tumeric," is native to tropical South Asia and grows in warm, humid climates; today it is widely cultivated in India and the Caribbean, as well as such countries as Sri Lanka and Fiji. Turmeric's active ingredient is curcumin. Turmeric offers a unique taste and visual experience for human beings in their experience of nature. Turmeric, which has a bitter, pungent flavor, commonly is used as a spice in curries and other South Asian and Middle Eastern cuisine. It also has an intense, yellow or yellow-orange color and is used to impart color to a wide variety of products, including cereals, canned chicken broth, ice cream, orange juice, and yellow cakes. It gives the bright yellow color to American-style prepared mustard. It also is used as a yellow dye for dyeing fabrics and even is used in chemistry in making test papers for alkaline solutions given a color change that it undergoes. 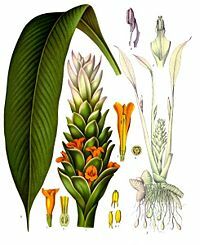 Zingiberaceae, the flowering plant family to which turmeric belongs, is known as the "ginger family," and contains aromatic perennial herbs with creeping horizontal or tuberous rhizomes. Members of the family have distichous leaves with basal sheaths that overlap to form a pseudostem. Flowers are hermaphroditic, usually strongly zygomorphic, in determinate cymose inflorescences, and subtended by conspicuous, spirally arranged bracts. The perianth is comprised of two whorls, a fused tubular calyx, and a tubular corolla with one lobe larger than the other two. Flowers typically have two of their stamenoids (sterile stamens) fused to form a petaloid lip, and have only one fertile stamen. The ovary is inferior and topped by two nectaries; the stigma is funnel-shaped. Turmeric (Curcuma longa) is characterized by its tuberous rhizome. A rhizome is a characteristically horizontal stem of a plant that is usually found underground, often sending out roots and shoots from its nodes. A tuber is an enlarged, fleshy, generally underground stem of certain seed plants, in which the typical stem parts are represented and which often serves as an organ of food storage and/or reproduction. The rhizome of turmeric is fleshy, oblong, tapered at either end, and from 5 to 10 centimeters (2-3 inches) in length and about 2.5 centimeters (1 inch) wide (Schonbeck and Frey 2005). The exterior can be yellow, tan, or olive-green colored, while the interior, which is hard and firm, is either orange-brown or deeply rust-colored, with transverse resinous parallel rings (Schonbeck and Frey 2005). The dense root breaks into a powder that is lemon yellow in color (Grieve and Leyel 1992). 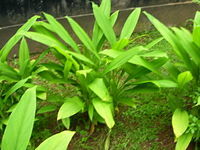 Turmeric also is characterized by its leaves and flowers. The leaves extend upward, with each leaf on an individual stem extending up directly from the rhizome. The leaves are elongated, lance-shaped, tapered (narrower) at each end, deep green and lustrous, and can be 60 centimeters in length (2 feet). The flowers appear spirally arranged around a cylindrical cone on the end of a stalk, partially protected by leaf sheaths (bracteoles—small modified or specialized leaves). This spike of flowers also arises directly from the rootstock (rhizome). Flowers are pale yellow in color and grow in groupings of three to five (Schonbeck and Frey 2005). Turmeric also is known as kunyit (Indonesian and Malay), Besar (Nepali), haldi (Hindi), arishina (Kannada), pasupu (Telugu), or manjal (Tamil) in Asian countries. In Assamese, it is called Halodhi. In Hawaiì, it is called `Olena. In medieval Europe, turmeric became known as Indian Saffron, since it is widely used as an alternative to far more expensive saffron spice. Native to tropical South Asia, turmeric thrives in warm, humid climates, generally with temperatures above 60°F (29.8°C) for best growth (Schonbeck and Frey 2005), and a considerable amount of annual rainfall. Among areas that turmeric is cultivated are India, Sri Lanka, East Indies, Fiji, and Queensland, Australia (Schonbeck and Frey 2005), as well as the Caribbean in the Western Hemisphere. Sangli, a town in the southern part of the Indian state of Maharashtra, is perhaps the largest and most important trading center for turmeric in Asia. Plants are gathered annually for their rhizomes, and re-seeded from some of those rhizomes in the following season. The rhizomes are boiled for several hours and then dried in hot ovens, after which they are ground into a deep orange-yellow powder. The powder from the pulverized rhizome can be dissolved in water or alcohol; for the medicinal tincture it usually is dissolved in boiling alcohol (Schonbeck and Frey 2005). Turmeric rhizome contains a volatile oil, a yellowish coloring material known as cucurmin, brown coloring matter, gum, starch, calcium chloride, and woody fiber (Schonbeck and Frey 2005). Turmeric contains up to 5 percent essential oils and up to 3 percent curcumin, a polyphenol. Curcumin is the active substance of turmeric and it is also known as C.I. 75300, or Natural Yellow 3. The systematic chemical name is (1E,6E)-1,7-bis(4-hydroxy-3-methoxyphenyl)-1,6-heptadiene-3,5-dione. It can exist at least in two tautomeric forms, keto and enol. The keto form is preferred in solid phase and the enol form in solution. Turmeric powder is used extensively in Indian cuisine. Turmeric perhaps is best known as a spice and is widely used for such purposes in South Asian and Middle Eastern cooking. It is almost always used in preparing curry in East Asian cooking (Herbst 2001). It is a significant ingredient in most commercial curry powders. Momos (Nepali meat dumplings), a traditional dish in South Asia, are spiced with turmeric. It has been used in cooking since at least 600 B.C.E. (Herbst 2001). 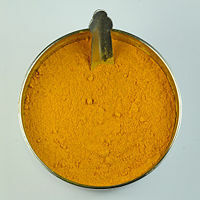 Turmeric also is used as a coloring agent. It has found application in canned beverages, baked products, dairy products, ice cream, yogurt, yellow cakes, orange juice, biscuits, popcorn color, sweets, cake icings, cereals, sauces, and gelatins. Turmeric is also used to give a yellow color to some prepared mustards, canned chicken broths and other foods (often as a much cheaper replacement for saffron). In combination with annatto (E160b), turmeric has been used to color cheeses, yogurt, dry mixes, salad dressings, winter butter, and margarine. Turmeric also is used as a food additive (coded as E100) to protect food products from sunlight. Turmeric added to such oils as sesame oil and olive oil extends their shelf life due to its antioxidant properties (Schonbeck and Frey 2005). The oleoresin is used for oil-containing products. The curcumin/polysorbate solution or curcumin powder dissolved in alcohol is used for water containing products. Over-coloring, such as in pickles, relishes and mustard, is sometimes used to compensate for fading. Turmeric has long been used in Eastern medicine, including both Oriental herbal medicine and Ayurveda, the Indian traditional medicine. Its use in Western herbal medicine has declined over the years. Among values attributed to turmeric are anti-inflammatory properties (making it useful in treatment of arthritis), prevention of or treatment of gallstones, enhancement of the flow of bile, reduction of serum cholesterol levels, and anti-bacterial and anti-fungal properties (Schonbeck and Frey 2005). In Ayurvedic medicine, turmeric is thought to have many medicinal properties and many in India use it as a readily available antiseptic for cuts, burns, and bruises. Practitioners of Ayurvedic medicine say it has fluoride which is thought to be essential for teeth. In Chinese herbal medicine, it is used as an anti-inflammatory pain reliever, treatment for jaundice, and is believed to stimulate menstruation and the movement of blood (Schonbeck and Frey 2005). It is taken in some Asian countries as a dietary supplement, which allegedly helps with stomach problems and other ailments. It is popular as a tea in Okinawa, Japan. It is currently being investigated for possible benefits in Alzheimer's disease, cancer, and liver disorders. It is only in recent years that Western scientists have increasingly recognized the medicinal properties of turmeric. According to a 2005 article in the Wall Street Journal titled, "Common Indian Spice Stirs Hope," research activity into curcumin, the active ingredient in turmeric, is exploding. Two hundred and fifty-six curcumin papers were published in the past year according to a search of the U.S. National Library of Medicine. Supplement sales have increased 35 percent from 2004, and the U.S. National Institutes of Health has clinical trials underway to study curcumin treatment for pancreatic cancer, multiple myeloma, Alzheimer's, and colorectal cancer. Alcohol extracts have show the ability to reduce blood sugar, possibly useful in the treatment of diabetes, and clinical trials in China demonstrate that its use as a food seasoning can reduce serum cholesterol levels (Schonbeck and Frey 2005). This spice is recommended by the World Health Organization (Schonbeck and Frey 2005). For hundreds of years, the powdered rhizome has been used to make a yellow dye for fabrics (Schonbeck and Frey 2005). Turmeric makes a poor fabric dye as it is not very lightfast (the degree to which a dye resists fading due to light exposure). However, turmeric today is commonly used in Indian clothing, such as saris. It also is used at times as a coloring for medicines (Schonbeck and Frey 2005). Turmeric is currently used in the formulation of some sunscreens. In chemistry, it is used in the making of papers to test for alkaline solutions, as a paper soaked in a tincture of turmeric turns reddish-brown and dries to a violet color in the presence of alkaline solutions (Schonbeck and Frey 2005). Turmeric paste is used by some Indian women to keep them free of superfluous hair. Turmeric paste is applied to bride and groom before marriage in some places of India, Bangladesh, and Pakistan, where it is believed turmeric gives glow to skin and keeps some harmful bacteria away from the body. हरिद्रा (haridrā) or वरवर्णिनी (varavarṇinī) in Sanskrit. Haldi in Hindi and Urdu. Holdi or Holud in Bengali. மஞ்சள் (manchal, literal: Yellow) in Tamil. 강황 (kang hwang) in Korean. 姜黄 (jiang huang, literal: "Ginger Yellow") in Chinese. Gelbwurz (literal: Yellow Root) or Kurkuma in German. Kurkuma or Japonský šafrán (literal: Japanese Safron) in Czech. Kunyit in Indonesian and Malay. Geelwortel (literal: Yellow Root) or Kurkuma in Dutch. Agricultural Research Service, United States Department of Agriculture. n.d. Taxon: Curcuma longa L.. Germplasm Resources Information Network (GRIN). Retrieved December 17, 2008. Grieve, M., and C. F. Leyel. 1992. A Modern Herbal: The Medicinal, Culinary, Cosmetic and Economic Properties, Cultivation and Folklore of Herbs, Grasses, Fungi, Shrubs and Trees With All Their Modern Scientific Uses. London: Tiger Books International. ISBN 1855012499. Ravindran, P. N., K. Nirmal Babu, and K. Sivaraman. 2007. Turmeric: The Genus Curcuma. CRC Press. ISBN 0849370345. Retrieved December 17, 2008. Schonbeck, J., and R. J. Frey. 2005. Turmeric. In J. L. Longe, The Gale Encyclopedia of Alternative Medicine. Farmington Hills, Mich: Thomson/Gale. ISBN 0787693960. This page was last modified on 23 December 2015, at 22:40.